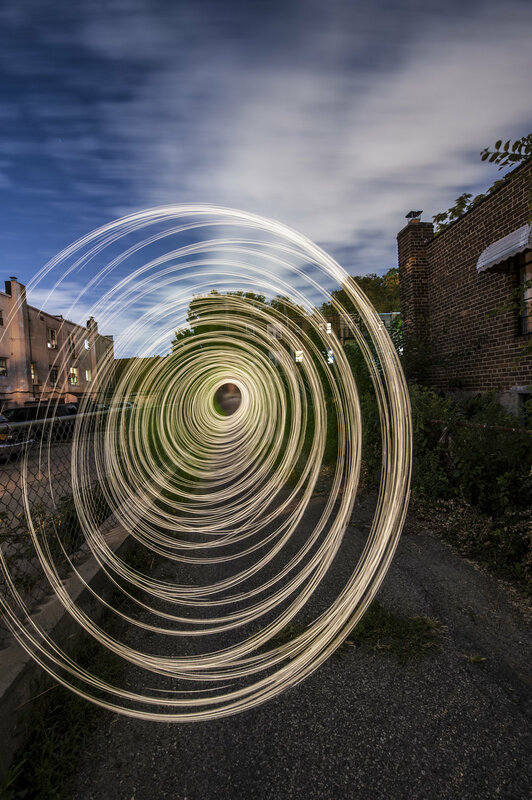 In 2011, Russian photographer Sergey Churkin founded what is now known as the Light Painting World Alliance (LPWA). Its goal is not only to unite artists who practice this niche within a niche within a niche, but also to help light writers around the globe develop their own skills as a way to elevate the quality of the art form as a whole so that it’s more globally recognized in the art world. It’s a lofty goal. And it’s one we applaud. Since its inception, LPWA has brought light writers together in various ways, including its website, Facebook and Instagram presences, international exhibitions, award presentations, meetups, and meetings and conferences hosted throughout the world. Fighting in the Rain. Light writing artwork done in collaboration with Nikolay Trebukhin. Olympus E-M1, Olympus M.Zuiko 12-40mm f/2.8 lens. 5 minutes, f/22, ISO 500. © Sergey Churkin and Nikolay Trebukhin. 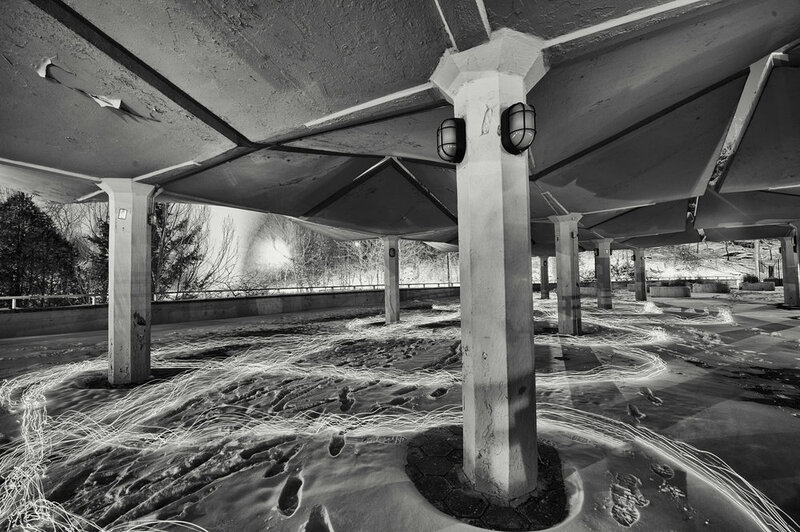 LPWA encourages night photographers everywhere in the world to participate, whether through official ILPD events, with a local photography group, or even just by sharing the art form with friends and acquaintances at personal gatherings. Recently we were able to chat with Sergey about his own growth as a light writer, how all of this got started, where it’s going, and what to expect on May 16. Q: Can you tell me about your passion for light writing? How did you start doing it, and how has it affected your development as an artist? 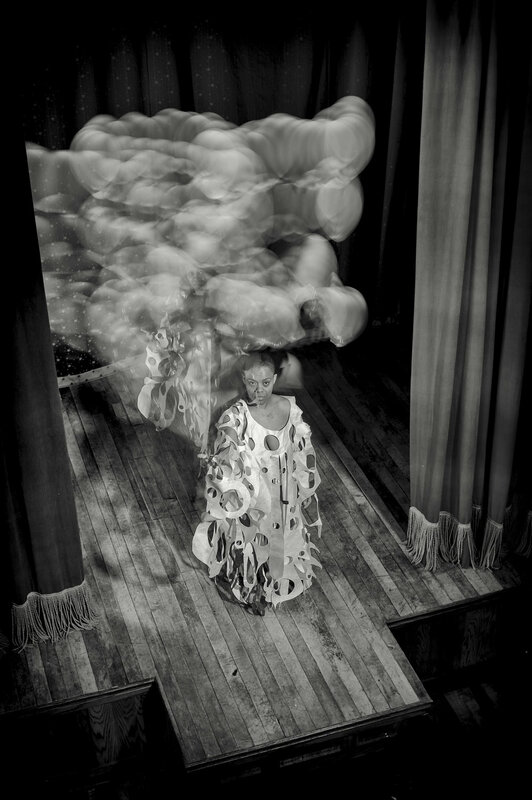 Sergey: In my work I am constantly looking for new visual forms and new technologies. In 2008, when I first saw light graffiti, I thought it was computer graphics, and I wondered how to achieve the same effect. So I tried drawing something like it on my computer, but all my attempts were futile. That upset me. I thought, “How is it someone else can draw this, but not me?” Then I discovered that the picture I was trying to model wasn’t computer graphics—it was photography with patterns of light! That’s when I discovered a galaxy called Light Writing. Almost at the same time, my eldest son showed me his own drawings with light. Relax Time. From the series “Real Life of Unreal Person.” Canon 5D Mark II with a 28-135mm f/3.5-5.6 lens. 202 seconds, f/8, ISO 200. © Sergey Churkin. Everything came together for me. I understood this technology. I realized that in my hands was a new, powerful and versatile tool for design. I spent nearly a year attempting to combine light writing with video, but it turned out that the specialties of drawing light impose fairly strict limits on its use in video projects. I do not like restrictions in the art process, so I decided that photography would give me more opportunities to express myself. Since then, I paint with light. I’m a professional video designer, so I know a lot about designing nice images. Light writing for me is another way to express my visual fantasies, with much more effective and natural execution. So, I already was a visual artist before falling into light writing. But light writing taught me to be more patient—to spend more time for planning and preconstruction of my artworks. I started to develop my own techniques and tools, which could give me limitless purposes. Thus, light writing brings the sense into my life. 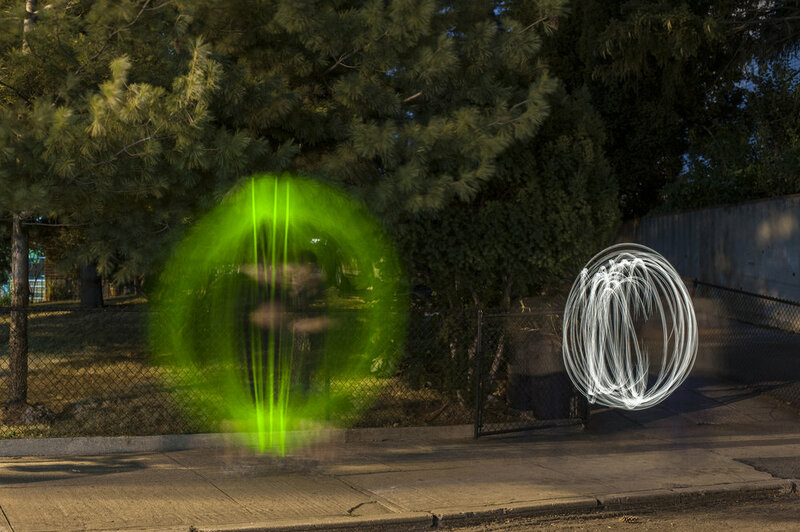 Q: What are some of your favorite light writing tools? Sergey: I prefer to use light tools like I would use real paint brushes. And I love handmade tools. Manufacturer’s tools bring comfort in making art, but also limitations of art itself. That is why I also try to develop my own techniques and my own tools. Portrait of Sergey's friend Vikthor Clarke, part of the series “Friends in Light.” Created with a handmade custom light brush. © Sergey Churkin. Q: What prompted you to spread this passion by forming LPWA? Sergey: I realized that our genre had two problems. First was low awareness, both among the ordinary public and among the art business. Most people simply do not know what light writing is. Second was the problem of quality. Too many people were doing light drawing just for funny snapshots. After some thought, I came to the conclusion that anyone alone does not change anything. By improving my own skill, I can achieve success and recognition, but that wouldn’t resolve those problems. To promote light writing to the masses needed a collective effort. I had a little experience with creative associations for Russian TV designers and promoters in the 2000s, so I saw what a collective mind with an active nucleus can do. I figured, why not do the same for artists writing with light? But of course, it would be ridiculous to think that all the work of making this huge Alliance since 2011 was done just by one person. It was done mostly by artists themselves. I only help them with ideas, inspiration and courage. I am happy to be friends with dozens, or even hundreds, of artists around the globe. And I am very grateful to all my light friends for their countless support, which really makes LPWA what it is. Dissected Guitar. Canon 5D Mark II with a 28-135mm f/3.5-5.6 lens. 19 seconds, f/13, ISO 160. © Sergey Churkin. Q: How quickly did LPWA grow? Sergey: Since 2011, the Alliance has grown to about 650 registered members. In fact, after 2015 I didn’t pursue more members as a goal anymore. What’s most important for me now is to inspire the community to be more active in making and learning art. The things we’ve been doing the last two years have showed me that this goal is very possible. Now I am concentrating more on organizations, developing relationships between LPWA and museums, galleries, festivals and other cultural institutions. Q: What’s next for LPWA—how do you hope it evolves? Sergey: Honestly, right now I am at a crossroads regarding LPWA’s future. Eight years of effort has told me that sometimes I need to take a break, to analyze past experiences. I see how much our community has grown since 2011, I see what is going on in our industry, and I see how new trends are born and die. So I keep that all in mind. Some of the goals of our starting years were realized successfully, and now the community requires new ones. We’d like to get regular columns in the world's largest magazines about art and photography, and over time would like to publish our own magazine, Light Painted World. Red Treble Clef. Image made with customized light blades. © Surgey Churkin. We’re also working to develop close contact with manufacturers of software and light tools, because they are not necessarily light painters and don’t always know what features should be in these devices. We need fine-tuned software and new light tools for professional light writing. We’d also like to develop close contacts with interior designers, the manufacturers of decoration accessories, and fashion designers. 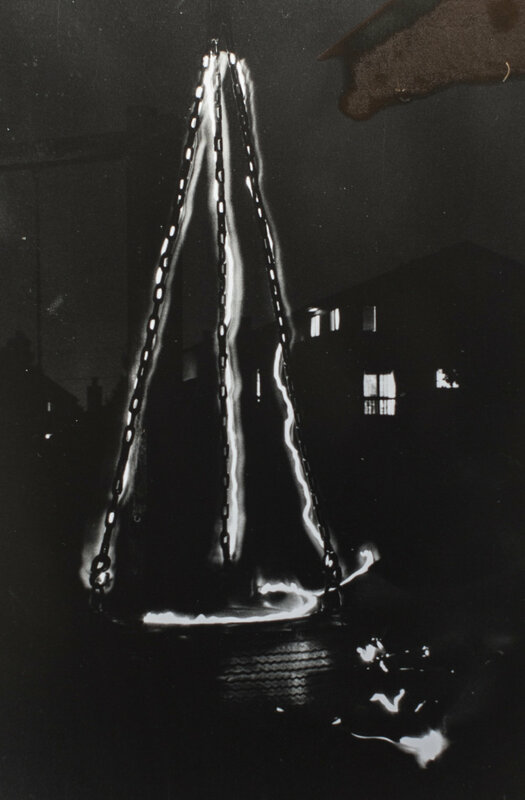 Light writing should be more than only photos or prints—we can use our artworks as a basis for many more goods. And off course, a major aspiration for the near future is to get official recognition from UNESCO for our art form, in the form of May 16—International Light Painting Day! Q: you have organized some huge collaborations of photographers working on one image. Can you talk about that? 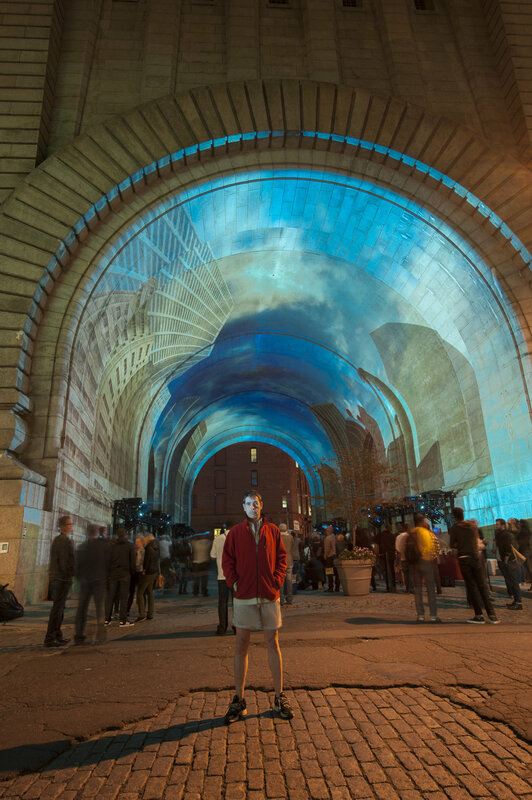 Sergey: It’s another inspiring and powerful way to involve an audience with the light writing world, to do these massive collaborative artworks. Our first experience like this was done in 2013 at our second LPWA worldwide exhibition in Paris, when 20 artists all together made a light writing animation on Place Concorde. Next was a massive collaboration on Plaza de la Gesta in 2014, when 34 artists made the IYoL2015 logo; and at the Dorum (Germany) LightHouse Meet-up, 24 artists created the same logo. 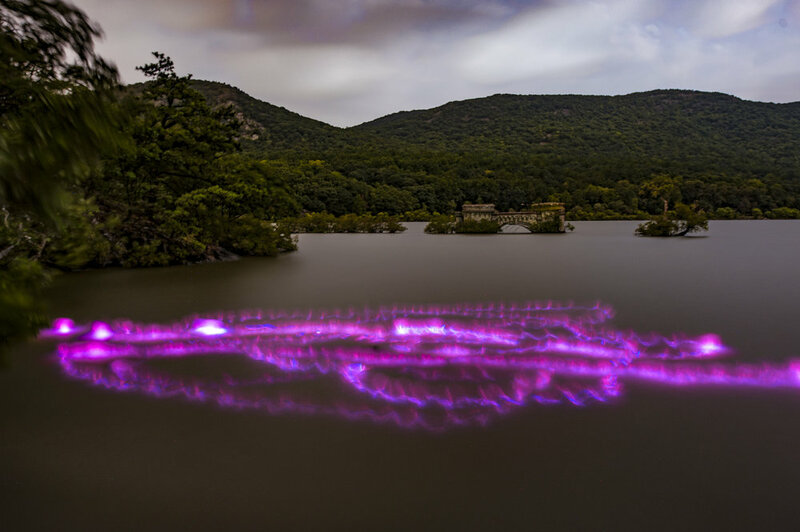 An outstanding collaboration was made in Longhushan, China, where 13 light painters created a massive image and animation. This is a very, very cool activity for all our artists. Collaboration light writing made during the LPWA Roma Meet-up 2017. Olympus OM-D E-M5 Mark II, Olympus M.Zuiko 7-14mm f/2.8 lens. 1.3 minutes, f/6.3, ISO 200. Click here to see all credited artists. 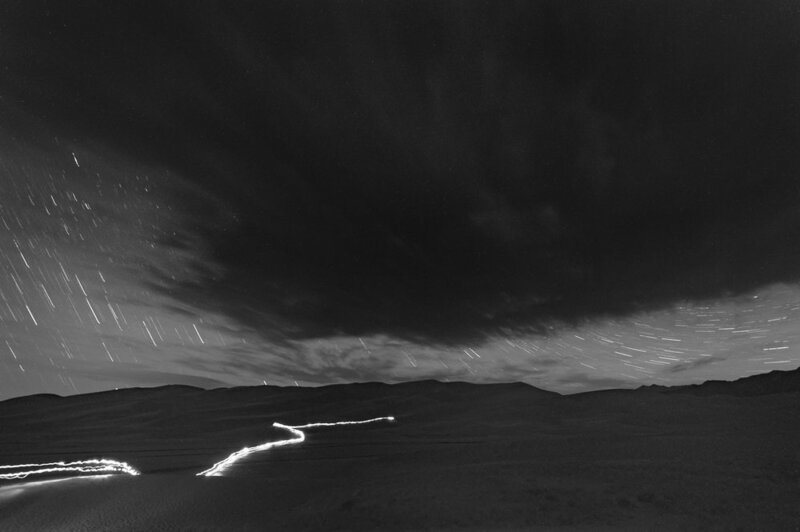 Q: Why do you think light writing is such an intriguing part of night photography? 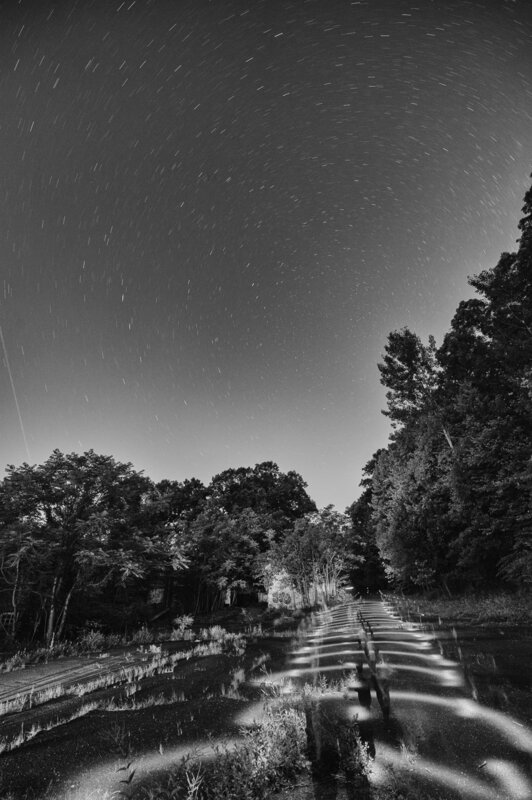 Sergey: For me, all parts of night photography are intriguing. Choosing a location, waiting for the proper time, finding particular details of a scene that can make this place magic, testing camera settings and tools. But light writing itself is an endless experience with an indeterminate end. Mostly I know what I want to draw, but I always pray for a lucky chance that could give me a moment of something incredible. Experiences like that are what really intrigue me. Q: What is your advice for someone who wants to get started in light writing, or someone who wants to learn more about it? Sergey: The only good advice is to start with regular tutorials, regular tools and then just copy the masters. Get your first experience—try to feel the light. Make a lot of senseless images just to understand how you can use light. Then forget all of it. Throw everything away and start to make your own light art. That is when you start following your own way, and when you no longer copy others. Lion and His Guest. 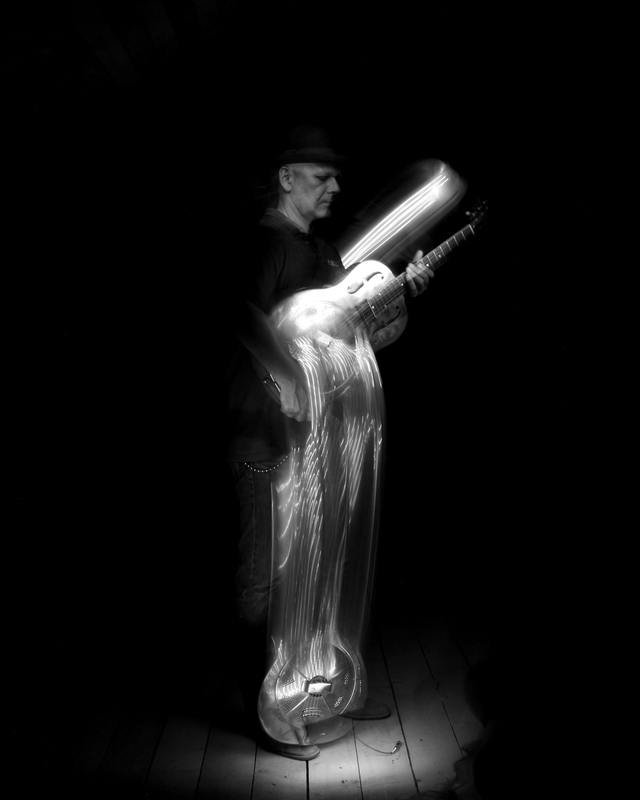 Made with light brush by Bernhard Rauscher. Canon 5D Mark II with a 28-135mm f/3.5-5.6 lens. 116 seconds, f/8, ISO 250. © Sergey Churkin. Q: Tell us about Light Painting Day. What is the goal, and how can people get involved? 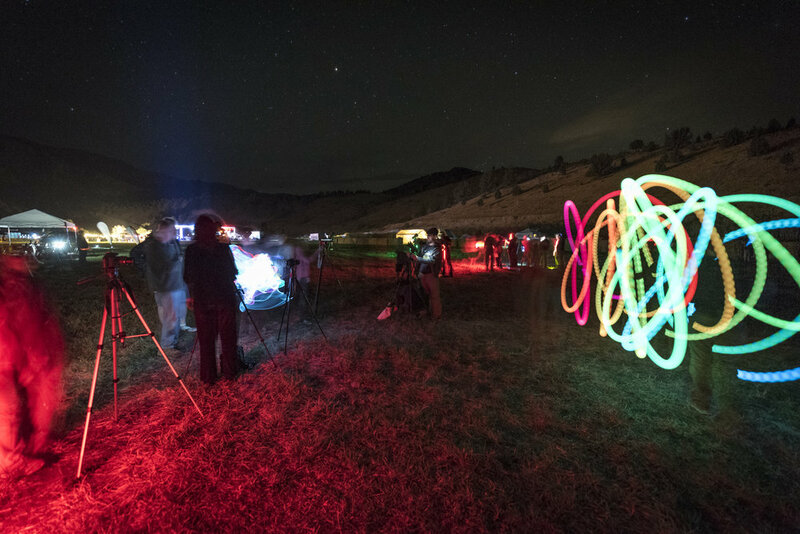 Sergey: International Light Painting Day is intended to give anyone—not only light artists—more motivation to learn about light painting and light writing. I really think that light writing is a much more inspiring art than more traditional drawing and painting. I would love to see light writing become a “family art.” Whole families could make this kind of art as a good and kind collaboration of father, mother and children! The best gratification for me could be if International Light Painting Day became a widely observed family celebration. 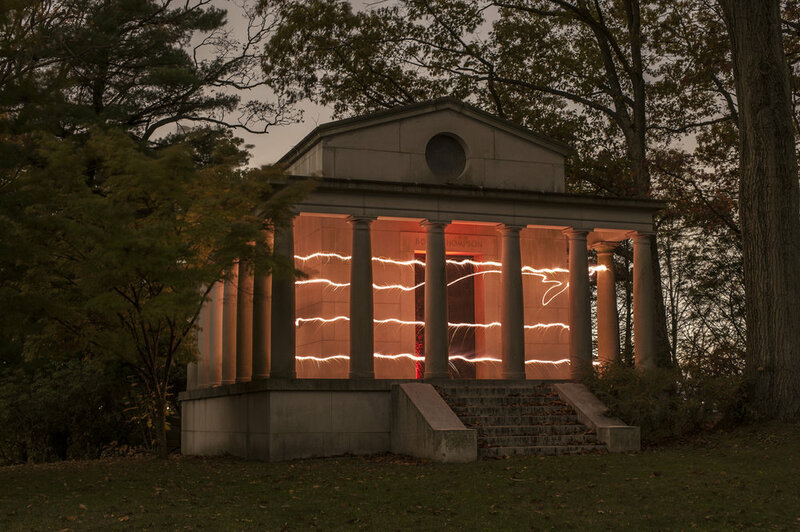 Of course, light painting is not just for May 16—we can celebrate this art form 365 days a year. So, International Light Painting Day is not for only professional photographers, but also for their friends, mates, family or even neighbors. 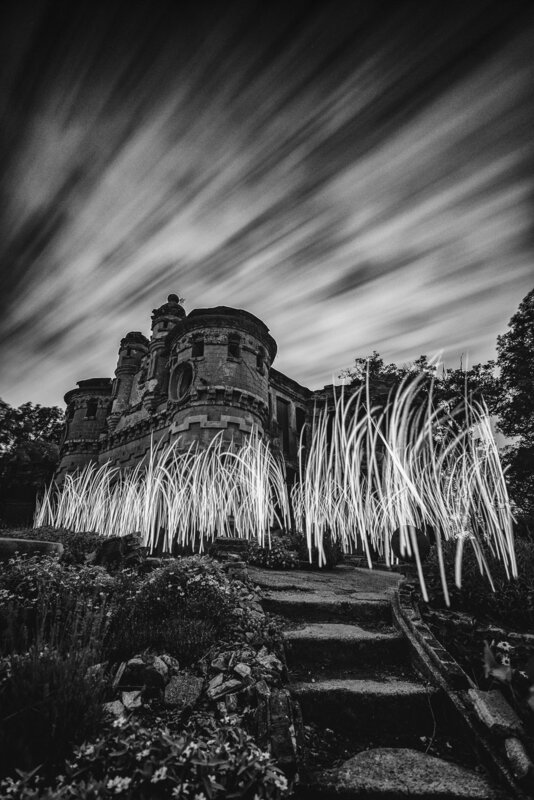 For more information about attending an International Light Painting Day gathering, see the official Event Programme. Sergey encourages individuals, camera clubs, and other groups and organizations to coordinate their own ILPD events as part of the global celebration. More more information, visit the ILPD webpage. When you turn your lights away from your subject and toward the lens, a world of creative opportunity opens up to you. But what to use? Where do we start? Help, Matt! Fear not, explorer of the night. … Grab a mug of cocoa and settle in. Let's get jiggy with light. You can use a really bright flashlight (like a Coast HP7R) to make a visible beam in the sky, or a low-powered penlight (like the Coast A9R) or a simple keychain LED light for delicate scribing in the air. Lomo also makes the really interesting Light Painter Z140TORCH. 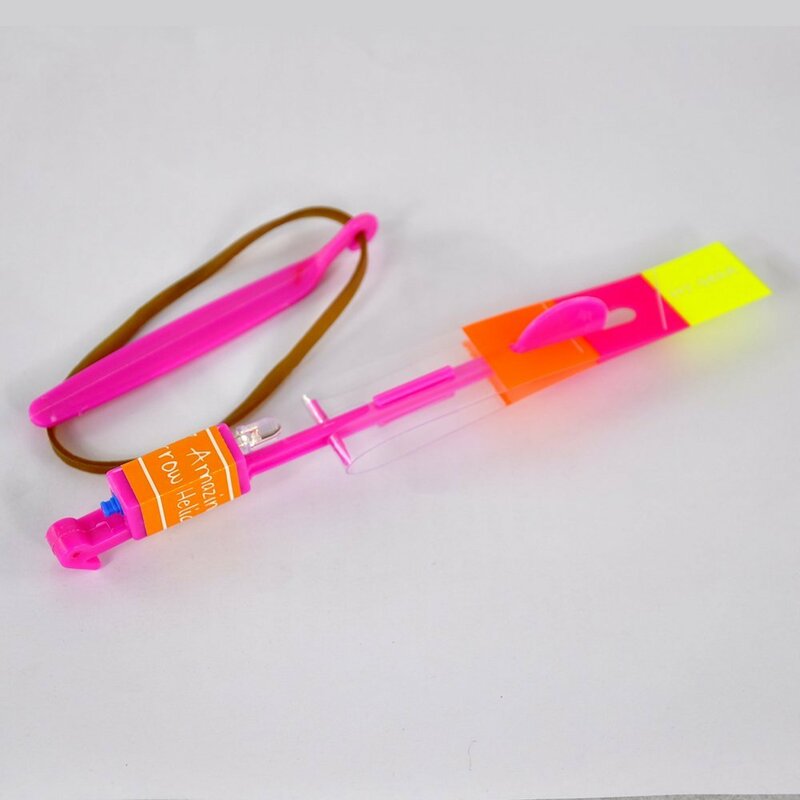 When you use a flashlight, you can accessorize it by adding some cool tools made just for light writing (and painting, but that's another topic …). Light Painting Brushes is the premier manufacturer that really understands light painters/writers. 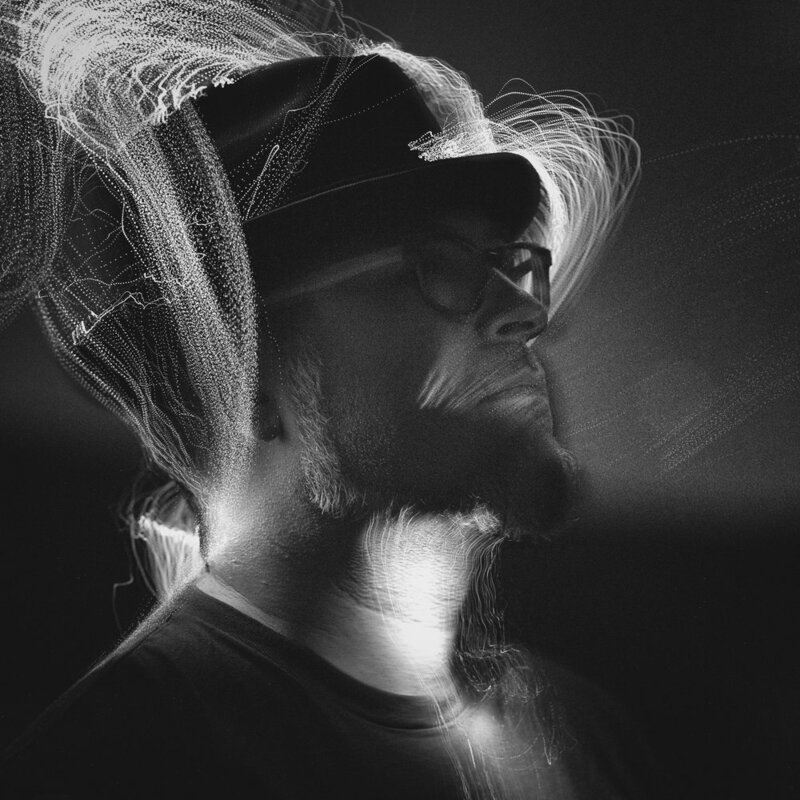 Jason Page (the creator) has made a robust system of tools to choose from, including plexiglass blades, fiber optic wands, color filters, light painting bottles and light swords. But if you really want to get serious about drawing in the air, snag a Light Writer set and loosen up your shoulder muscles. 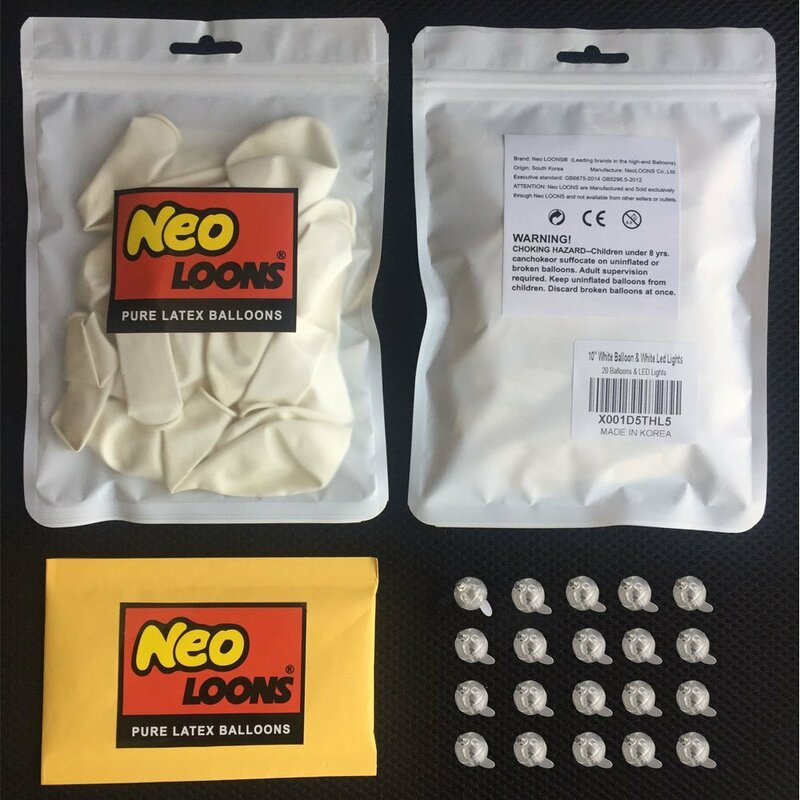 Be sure to grab a Universal Connector and get started! FWIW, having this one accessory doubles as a great snoot. Kill the spill from the edges of your flashlight for more control. Laser pointers aren't just for making cats dizzy. They are also a cool way to scribe really sharp lines on objects. Tip: Never point it directly at your lens—it can irrevocably damage your camera's sensor. 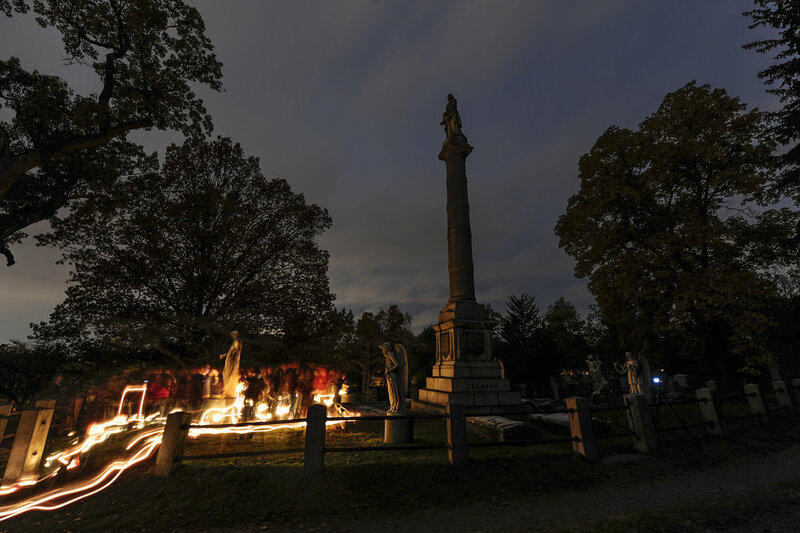 I love October, because there are lantern tours at cool places like Sleepy Hollow Cemetery. Waiting for a tour to walk through with that gorgeous upglow makes for delicious, warm light. A less combustible option is an LED camping lantern. Gosh, I haven't done this since I was a teenager (can't you tell by the above photo?). But grabbing a simple cigarette lighter and using it behind objects can create smooth, warm light trails. Just be careful not to burn your thumb! The classic commercial realization of being able to write images in the air, one row of pixels at a time. 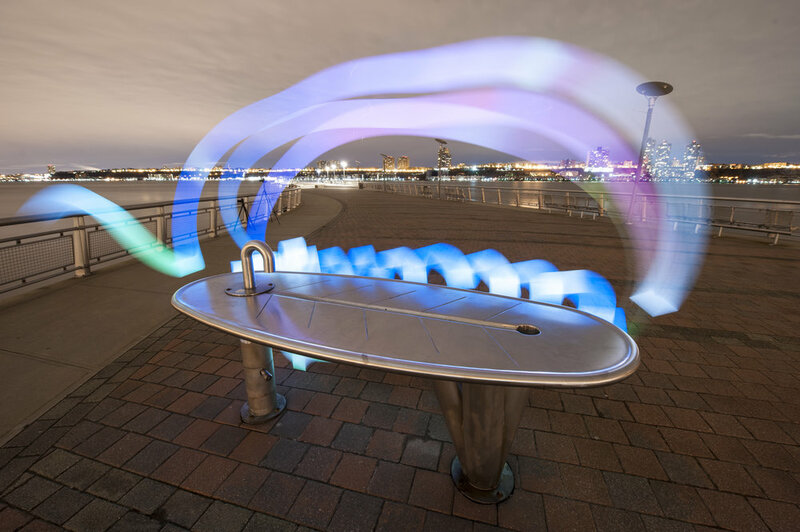 Load your designs into the 6-foot Pixelstick and swing it around for massive light writing effects. Are you handy with electronics and programming? 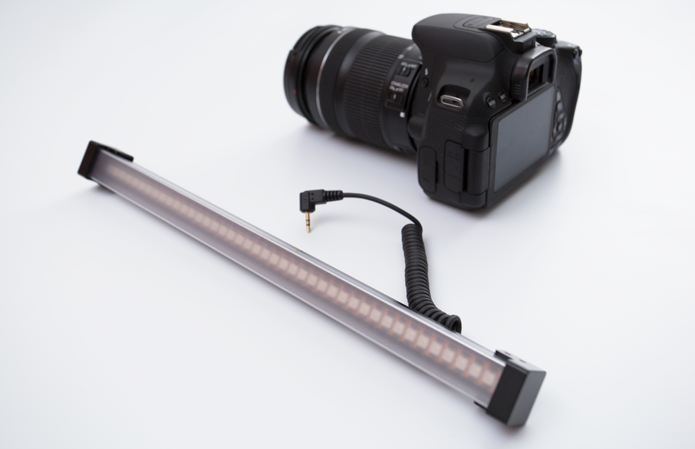 Well, you can make your own Pixeltstick/Magilight with the instructions provided by Michael Ross on his website. He released this project back in 2010, making him the O.G. digital light writing wizard. 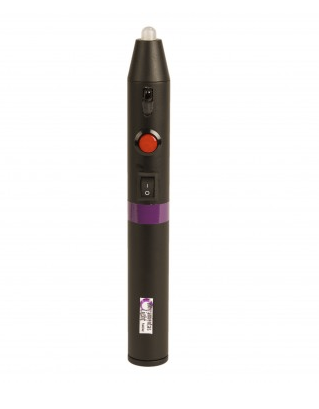 This powerful handheld LED wand has a rechargeable battery, diffuser, tungsten gel filter and more. Pointed toward the lens, it makes a smooth bar of light. Darren Pearson (aka prolific and talented artist @dariustwin) created the Night Writer light writing system with interchangeable color tips so you can craft your fantasies in the air like Picasso. The Lapiz Freehand RGB is a tool I haven't used (yet …) but I had to share. It's for the artist who wants to draw their visions freehand. RGB controls, dimmer and 20 color presets with memory. Hella cool. Visit the website (link above) for some images showing what you can do. Digital projectors are tiny now! Pocket Pico Projectors even come with batteries. So, you can bring your images or designs out into the field and project them onto surfaces, people and more! The flashlight and screen are both light sources. Plus, I bet you already have one! The larger the light source, the softer the effect. I often use the GlowStickGo app to make pretty colors. The $0.99 upgrade is worth it. In the above examples, I noticed hikers or climbers using headlamps and flashlights in my scene. Rather than gnashing my teeth, I said, "Heck, let's use this as an advantage." Either stuff a glow stick inside pearlescent balloons, or get some with the LEDs already inside. Makes a soft, ethereal effect. Christmas lights make sharp, crisp lines of light. And if you tape them together in a bundle, you can create a bright grouping of light streaks. Or you can be like one our Death Valley attendees and make a suit out of them, put it on, then frolic in front of your open shutter. Be sure to get battery-powered lights, or you'll have to bring a noisy gas-powered AC generator. Want a good workout? Try throwing an LED Frisbee back and forth with a pal for eight minutes without pause. It will test your endurance, but makes for fun night photography! I love these little rubber-band launched LED toy helicopters. Keeping three to five of these in my bag takes up barely any room at all. Creating mysterious alien landings anytime is easy. I love the foxfire effect that glow sticks have. They aren't very bright, but they can add a subtle mystery to your light writing, and are small and easy to carry. Poi Balls are as fun as a Hula Hoop—without need for bodily coordination. Slightly brighter than a glow stick. I use EL Wire to make fire effects, without the danger. Duh. 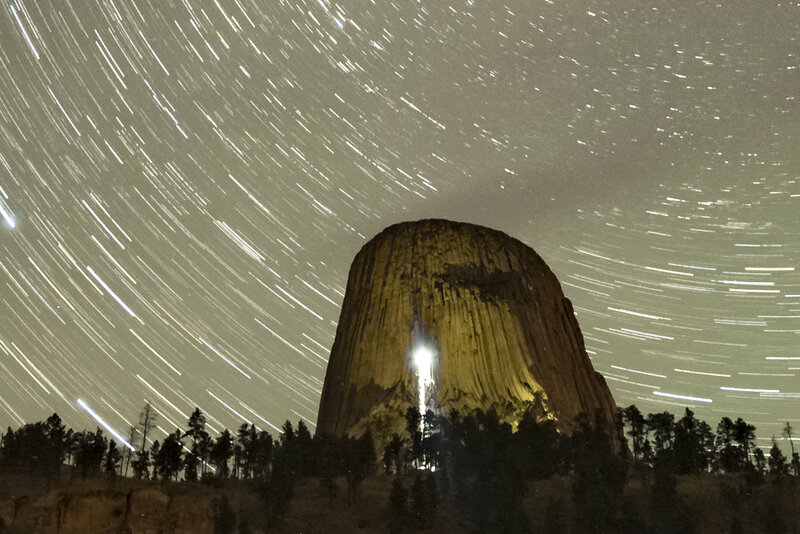 Fireworks are forbidden in national parks. Don't do it. But when and where you are allowed to use sparklers, there is no substitute! Sparkly, drippy fun. Again, don't light fires in national parks except where expressly permitted. Like in campsites. In fire rings. And not with steel wool—stick to a lighter, or rubbing two sticks together. But for those times when you're in a place that does not have those restrictions, and it's near/on water or in the rain, and not on or near wood, spinning steel wool in a wire whisk on a string makes for some amazing effects. Some lighting fixtures have an AC cord (not hard-wired). I've experimented with swinging them through a long exposure with great success. So, you may think I'm nuts. Couldn't agree with you more. I am nuts about lights, and experimenting with them. I hope you try all of the above! Have you tried something I didn't mention? Let me know in the comments! I'm game for some more light writing fun. Nikon D750, Sigma 24mm f/1.4 Art lens. 73 seconds, f/8, ISO 200. 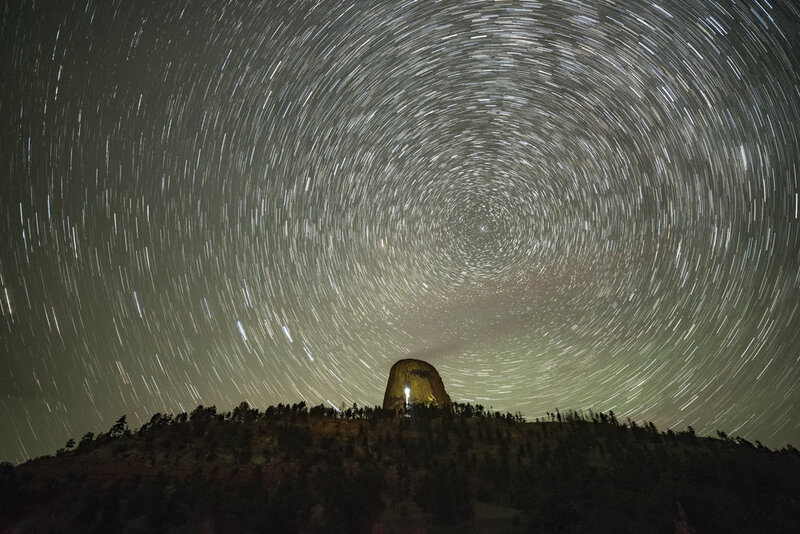 We were positioned high on a hill with 360-degree views in order to be able to see and photograph the aurora no matter where it appeared in the sky. The weather was perfect, the sky mercifully clear, and the vistas magnificent. The group was excited with anticipation as the KP index of 5 was a good sign that the sky would put on a good show for us. There was a large upright stone, about 5 feet high, perched neatly near the edge of the hill. It reminded me of an image by the Czech photographer Jan Pohribny titled “Positive Energy Emitter” (Figure 1). 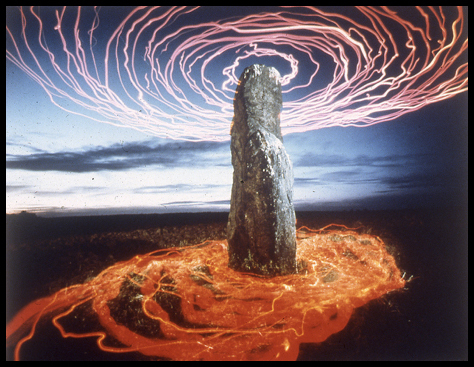 Pohribny’s photo was of an ancient standing stone at twilight, and he had circled the stone with a red light held overhead and also pointed down at the ground to create the “energy vibrations” implied in the title. Figure 1. “Positive Energy Emitter," 1992 Jan Pohribný. From the series New Stone Age. I thought that this would be the perfect opportunity to attempt an homage. My thought was that the stone before us could be a beacon to summon the aurora, as well as a tribute to an early light painting innovator. After my standard procedure of framing the composition, focusing and determining the ambient exposure, I made my initial attempt at creating the rings of light around the stone (Figure 2). Figure 2. Initial experimentation. Nikon D750, Sigma 24mm f/1.4 Art lens. 30 seconds, f/16, ISO 100. 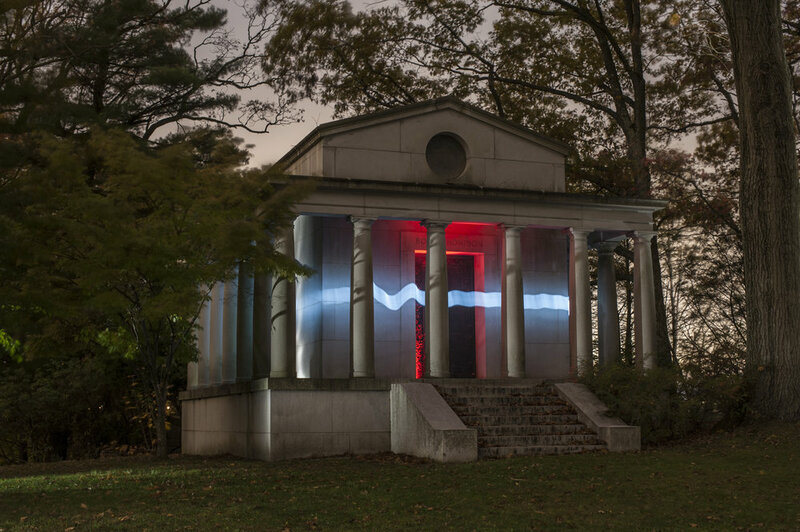 First I set up a Luxli Constructor Large Block Bi-Color LED Light on the ground pointed at the stone, set on low power at 3200 K––partly to illuminate the stone, and partly so I could see to move around without tripping over the other rocks on the ground. I also used a short section of frosted plastic tube that I had removed from a collapsible light sword from Light Painting Brushes, and fixed it to my Coast HP5R flashlight on low power, which created a DIY light wand. I wasn’t satisfied with the look I was getting with the wand, so Erika, one of the workshop attendees, suggested using a different Light Painting Brushes tool that she had, a purple translucent light writer (Figure 3). Figure 3. Second attempt. Nikon D750, Sigma 24mm f/1.4 Art lens. 30 seconds, f/13, ISO 100. We liked the look with the translucent light writer better, but since there was still a lot of light in the sky, we were limited to a 30-second exposure at ISO 100 and f/11. Because the ground around the standing stone was covered with rocks of various sizes, it wasn’t possible to move around very quickly in order to create the desired light writing effect in such a short time. We could make only a few revolutions during the half-minute exposure. But I knew that as the sky got darker, we would be able to extend the exposure time and create more light rings. Meanwhile, Erika’s husband Dan suggested adding another element to the image using shadow painting rather than light painting. His idea was to project a hand shadow onto the rock by placing his hand between the rock and a light source. We loved the idea, and the initial result reminded us of pictographs found in ancient rock art sites around the world. The first attempt was encouraging, so we made a few refinements until we came up with an iteration we all liked. I also added some illumination to the foreground by sweeping a flashlight low to the ground on the left and right sides to fill in the shadows and reveal some detail (Figure 4). Figure 4. Third attempt. Nikon D750, Sigma 24mm f/1.4 Art lens. 30 seconds, f/11, ISO 100. By this time, things were getting complicated, as Erika was making the rings around the stone, Dan was holding his hand in position for the shadow, and I was lighting the ground and creating the hand shadow, which took precise alignment of Dan’s hand and the flashlight. Each of us had our cameras set up and were shooting side by side. Fortunately, Steve, another participant, was available to assist us by opening all the shutters, which gave us time to get into position before the exposures started. We made one more frame just as the aurora was starting to appear in another part of the sky, and that frame was exactly the vision we were working toward (Figure 5). So we called it a wrap, and repositioned ourselves to photograph the aurora. Figure 5. Final image. Nikon D750, Sigma 24mm f/1.4 Art lens. 73 seconds, f/8, ISO 200. Thank you Erika, Dan and Steve. It was an honor sharing this experience with you! One of the most fun parts of being a night photographer is experimenting with light during long exposures. Some people do it for practical reasons, like adding light where it's dark. Some use it to add creative or artistic flair to an image. Whatever your purpose, I am going to show you how to build a kit for both painting and writing with light. 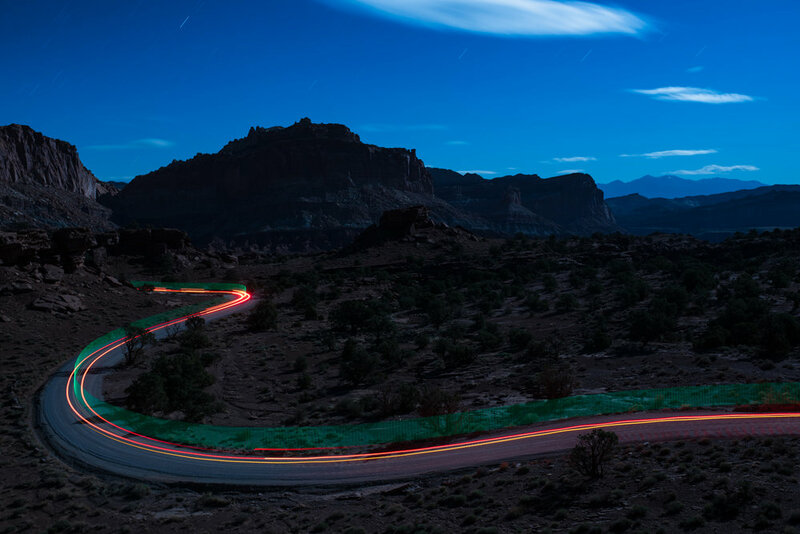 Light painting: adding light to something within your frame—e.g. shining lights on the grass, trees, people, rocks, etc. 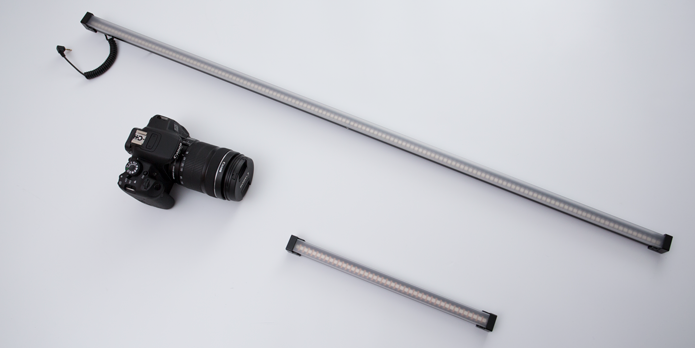 This light bounces off those objects, defines them, and comes back to the lens. 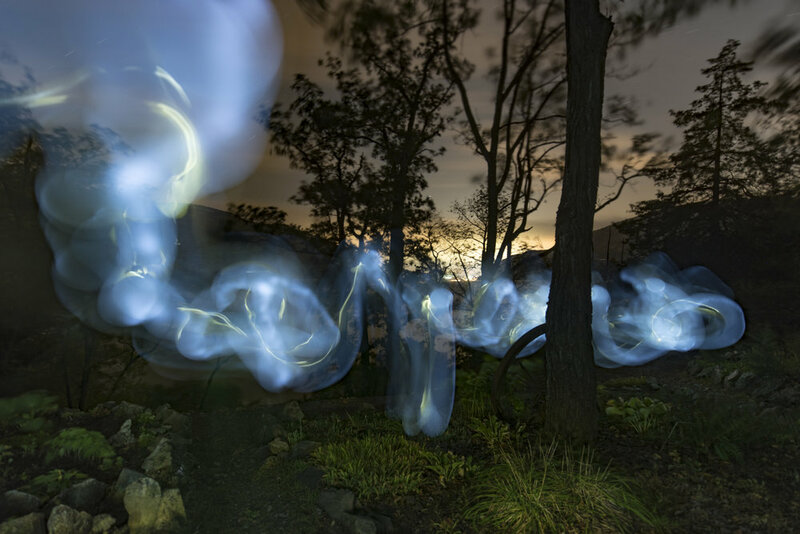 Light writing: turning your light source toward the lens—in effect, you are "writing" with the light, capturing its vector, or path, through space in single or multiple exposures. For the record, my definitions are not universally adopted or applied. Many people refer to "writing" as "painting." It's neither right or wrong, as long as we all get along. ;-) But for the purpose of this article, let's agree on the above. I use both methods to make long exposures at night. Both practices have a practical purpose and identifiable effects. In Figure 1, you'll note that a proper exposure that does not blow out highlight details in the sky leaves the foreground lacking sufficient detail. Light painting to the rescue in Figure 2. Both images are from the backcountry of Valley of Fire State Park in Nevada. Figure 1. Without light painting. Figure 2. With light painting. In Figure 3, you'll see a starlit scene with a Pixelstick used to light-write around a tree in the foreground. Figure 3. 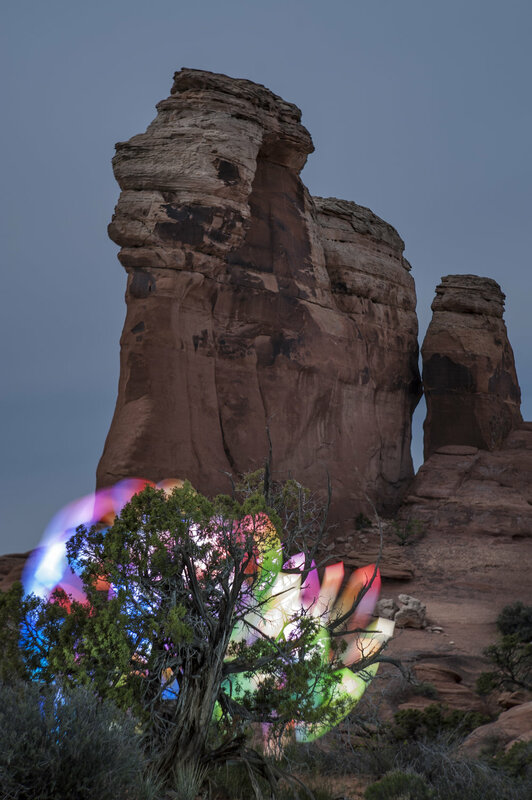 The Windows at Arches National Park just before moonrise, with light writing done with a Pixelstick. 68 seconds, f/2.8, ISO 6400 with a Nikon D750 and Nikkor 16mm f/2.8 fisheye lens. And just for fun, Figure 4 is an example where I played catch with my friend using a Frisbee with a blue LED in it. Figure 4. Three 2-minute exposures stacked. You try vigorously throwing a Frisbee for six minutes in Denver. I'm still catching my breath. Figure 5. 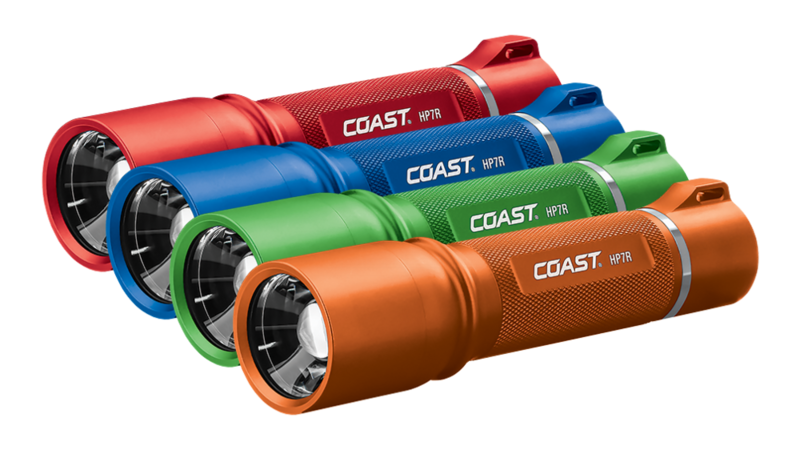 From left to right: Coast HP14 (629 lumens, 813-foot beam), Coast HP7R (300 lumens, 754-foot beam), Coast HP5R (185 lumens, 600-foot beam) and Coast A8R (low-power, 62-foot inspection beam). 1. One high-power flashlight with a tight or focusing beam for illuminating objects in the distance. I suggest 300 lumens or more. I use the Coast HP7R (Figure 5) most often. 3. One pack of Rosco sample gels to warm or cool your light temperature or to make funky colors. 4. Some gaffer tape. Because, you know, gaff solves nearly anything for a night. Figure 6. Coast FL75R dual-beam focusing rechargeable headlamp. 1. One headlamp (Figure 6) for hands-free safety while trekking around in the dark, and/or for hands-free gear operation. Just be careful not to ruin anyone else's shots when wearing it. Or to blind them by looking at them when it's on. 2. 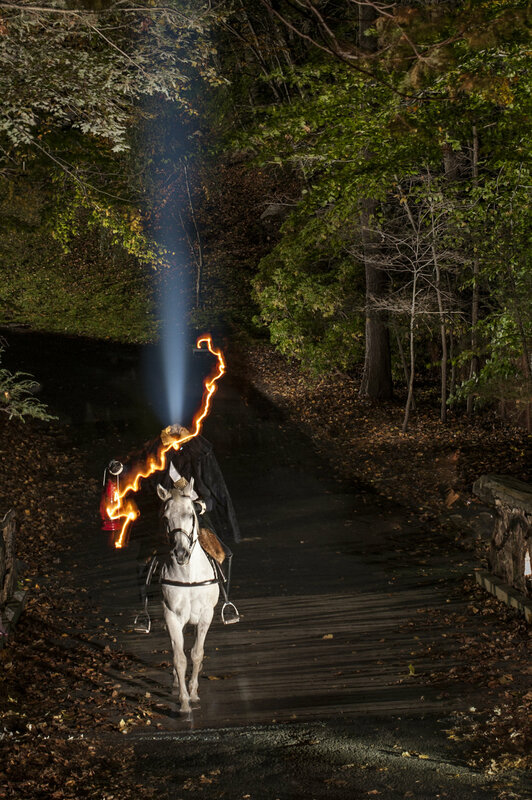 One massively high-power flashlight for light-painting distant objects. I carry the Coast HP14 for this (Figure 5). 3. One kinda-low-light flashlight for delicate work—around 100 to 200 lumens at most. See the Coast HP5R (Figure 5). 4. One good incandescent flashlight for painting with a warmer color temperature than sans-filter LEDs. It might stay in your bag a lot, but sometimes it's just the right solution. 5. One roll of Cinefoil. Cut some, fold it up and put it in the bottom of your bag. Use it to make your own snoots anytime. Mechanisms for light writing are a bit different, and come in all shapes, sizes and builds for varied situations. You can learn how to use these tools for their intended purposes, and then use them for anything else you can think of too. Creativity is the key. Here are some good options to get ya going. 2. 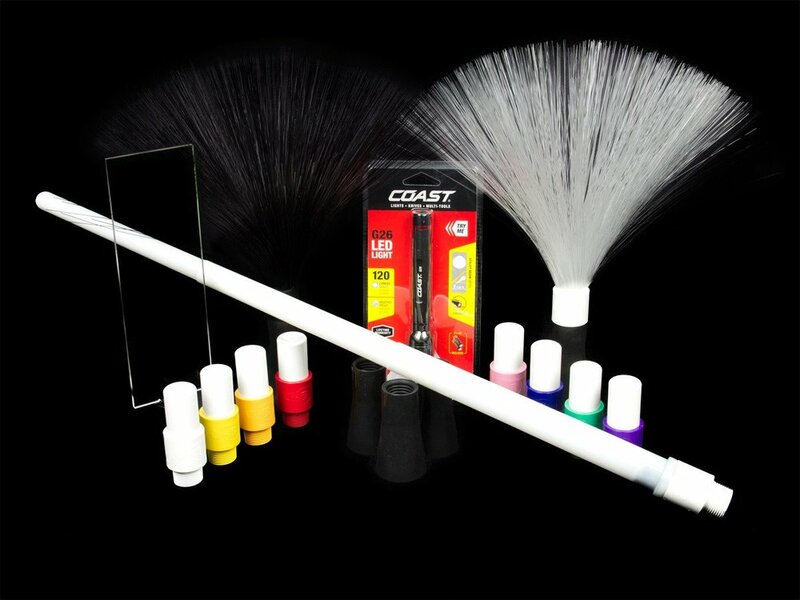 One Light Painting Brushes Deluxe Starter Kit. This collection of awesome creative tools will keep you playing around in the dark for months. It has everything from the essential Universal Connector (which alone is a great snoot to control light spill), to color cones, a fiber optic wand (I call it the light octopus) and a Jedi-esque light sword. Figure 7. (No audio.) See the light-beam spread demo from a Coast HP7R, and a quick overview of Light Painting Brushes items mounted on same flashlight, with zoom in/out. 3. 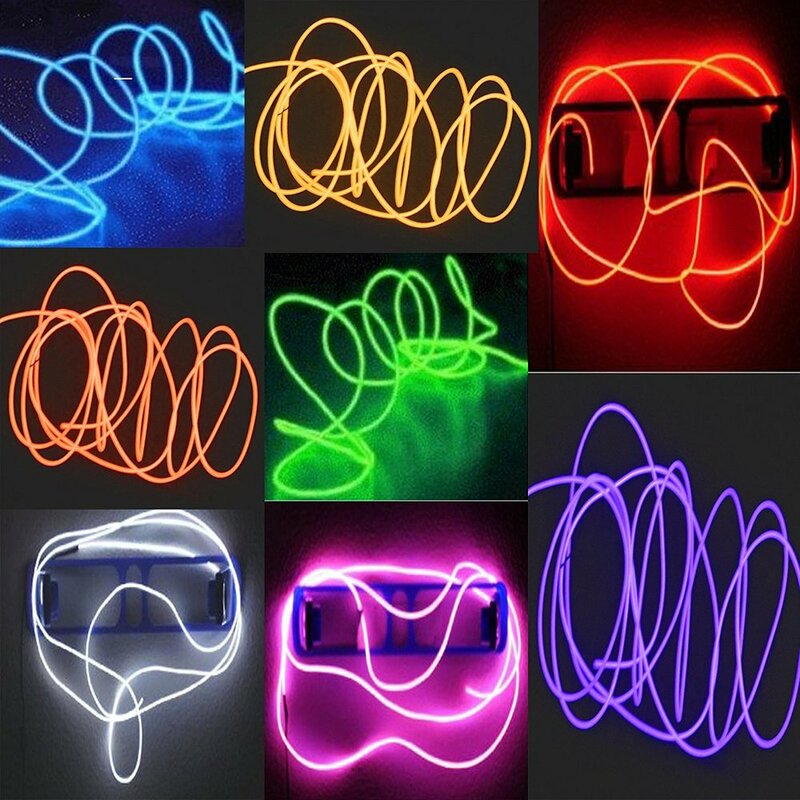 EL Wire. It's inexpensive and makes soft, glowing trails like foxfire. Be careful, though—it's sometimes delicate when transporting and swinging around. Figure 9. Battery-powered Christmas lights. 4. Battery-powered Christmas lights. With the advent of LEDs, you no longer have to use C or D cells to power them—now it's a pair of AA batteries (light!) and you're good to go. 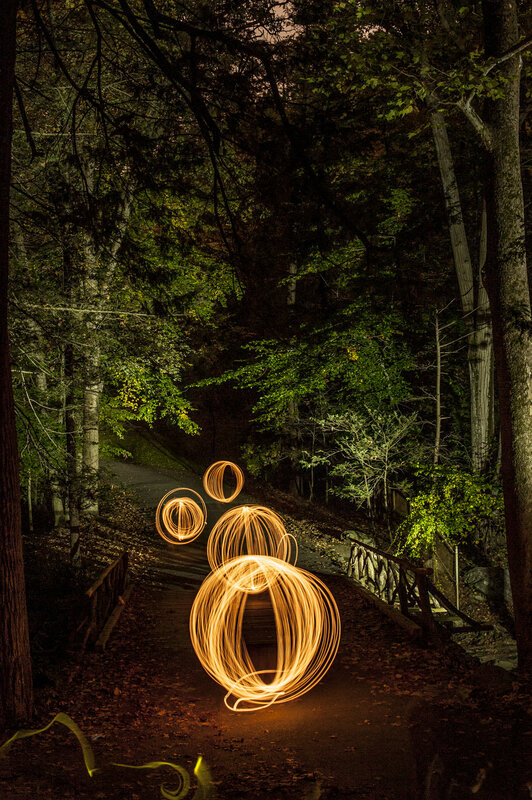 Swing them around to make orbs and light trails. I like to buy them for a dollar or so right after Christmas! I use all of these indiscriminately. Why? Well, when you say no to something, your options are limited. So why not try everything and then some? Below are some more images I've made while experimenting with light writing and painting.